For price, I prefer it to be free, and if it’s not free, then at least a lite version that I can try out in order to decide if it’s worth the money. After our first app being one that cost money and being of zero interest, I’ve had less interest in paying for an app before testing it. Educational value and user friendly are no brainers. And it can’t irritate me because then I won’t want to hear him playing it. Last week, I downloaded Catch a Match. Catch a Match is like the children’s classic game Memory. 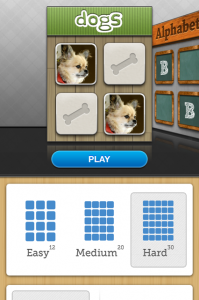 In the free download, you get to match various dogs and puppies to each other. You make the match, the cards clear. It comes in three levels: easy (with 12 cards/6 pairs of dogs to match), medium (20 cards/10 pairs of dogs to match), and hard (30 cards/15 pairs of dogs to match). 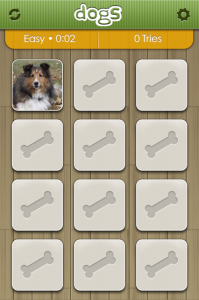 Amazingly enough, Catch a Match fits all of my toddler iPhone app criteria. The game itself is free, but if you or your child decide you want to match something other than dogs, there are paid “expansion packs” that you can get for a couple of bucks. Options include matching letters and numbers, matching presidents, and a few other matching decks. It’s definitely user friendly. After all, all one has to do is tap the card to flip over a puppy. Norton can handle it with no problem. 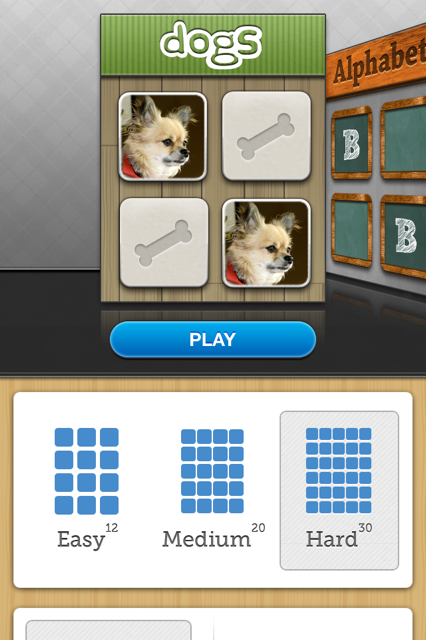 Granted, he’s not terribly adept at making the matches since he doesn’t really get the point, but it’s puppies. He gets to play with my phone and look at lots of puppies. That’s a pure win. Not irritating? I’m ashamed to admit that not only is the game far from irritating, I actually enjoy playing it myself. This is definitely a game that I’d recommend.